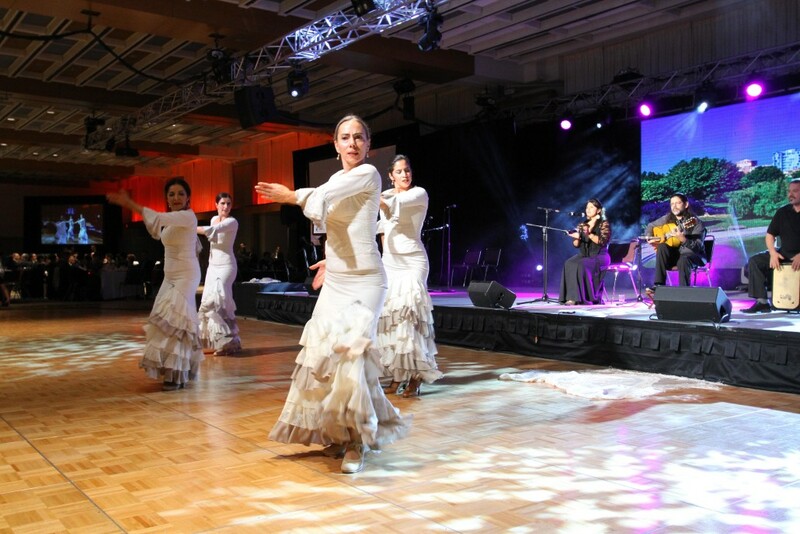 TORONTO, November 7, 2015—A massive display of the Barcelona landscape showcased the radiance of the vibrant city. The dynamic games lounge produced an air of palpable excitement. Such was the scene at the 24th annual Cathay Ball, Presented by CIBC, a fundraising gala for the Mon Sheong Foundation, which took place on November 7 at the Metro Toronto Convention Centre North Building. As with years past, the occasion brought together over a thousand government officials, business leaders, and prominent members of the community for a splendid celebration. Some of the guests even showed up donning the Spanish national costume, matching the event’s theme of “An Evening in Barcelona”. The lively crowd, combined with the beautiful décor, bathed the entire venue with the passionate energy that Spanish culture is known for, resulting in a memorable evening. All donations raised from the Cathay Ball will be used to support Mon Sheong’s long-term care centres and other charitable initiatives. While speaking about the future direction of the Mon Sheong Foundation, Chairman Tim Kwan specifically detailed its innovative Private Care service. “Over the past decade, Mon Sheong has seen remarkable growth in its development. Aside from the Richmond Hill Mon Sheong Court and Mon Sheong Care Complex, we have also introduced a unique solution for seniors and families with a pressing need for care services. Whether they are seeking a long-term or a short-term stay, the senior is able to move in immediately to resolve the issues at hand. Because Private Care does not receive any government funding, its operating costs are substantial. In fact, the monthly fees we receive are not even enough to cover our expenses, meaning that we must subsidize the rest. Truly, we rely on the generosity of businesses, community organizations, and individual donors, to support this worthy cause.” Tim also took the opportunity to thank the evening’s volunteers, and expressed his appreciation of the event’s organizing committee, especially its two co-chairs, Jo-Cy Lee and Amy Tam. Together they kicked off the banquet to a round of applause. This year, “An Evening in Barcelona” featured reception halls modelled after the streets of the vibrant city and also a Spanish guitarist to boost the atmosphere with his live music. An area of the venue was designated as a special games lounge, enabling the guests to experience the vigour and energy of soccer excitement for themselves. Even the evening’s entertainment was full of Spanish flavour. Working with the Spanish Consulate in Toronto and many community organizations, the committee had invited soprano soloist Jennifer Taverner to perform her renditions of several Spanish classics. The Esmeralda Enrique Spanish Dance Company was also on hand to perform the traditional flamenco dance. Jennifer’s soul-stirring vocals and Esmeralda’s elegant movements were a feast for the eyes and ears of everyone in attendance. To enhance the Barcelona theme, the registration desks were dressed up and arranged to look like the check-in area of an airport, providing the perception that everyone was indeed flying to Spain for an evening. Taking things further, the silent auction area was decorated like an airport duty-free store, letting the guests enjoy the delight of duty-free shopping within five unique departments. Thanks to the contributions of sponsors and donors, the silent auction once again featured over two hundred collectible items and valuable goods, and was a popular destination throughout the evening. This year’s special draw prize was a pair of Air Canada roundtrip premium economy tickets between Toronto and Barcelona. A premium economy seat was actually on display in the hall to allow guests to personally experience their comfort. Naturally, the special draw winner, who purchased the lucky ticket from among the three hundred tickets available, could not contain their excitement. Toward the conclusion of the night, the draw for the Mon Sheong Charity Raffle was also held. These results will also be posted in Chinese newspapers and on both the Mon Sheong Foundation and Cathay Ball website. New elements to this year’s edition of the Cathay Ball included the redesigned program book, which now doubles as a lifestyle magazine containing travel snippets, featured columns, and exclusive interviews. This precious publication was put together by award-winning design house Palettera Custom Correspondences, and a number of the guests had left the banquet with their copy in hand. 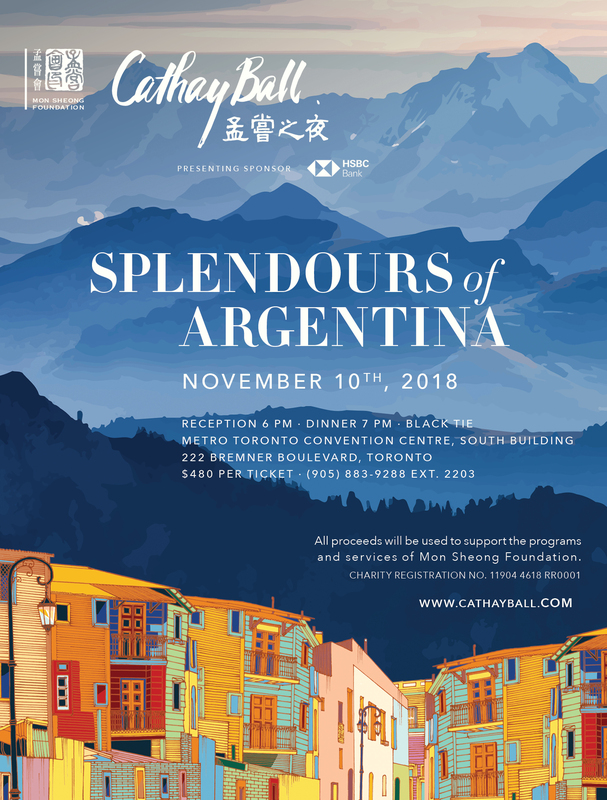 A brand new event webpage, www.cathayball.com, was also introduced, giving guests the ability to purchase tickets online, register in advance and select their meal, and to relive the evening by browsing through the photo album. The 2015 Cathay Ball was another tremendous success thanks to the support of many donors and sponsors, including: Presenting Sponsor CIBC, Diamond Sponsor MediSystem Pharmacy, Official Airline Sponsor Air Canada, Gold Sponsor BMO Financial Group, and Gold and Design Sponsor Palettera Custom Correspondences. Mon Sheong also wishes to extend its heartfelt thanks to everyone who contributed but were not named in this article. It is only through the generosity of many that the Foundation can continue to serve the community. To learn more about the Mon Sheong Foundation and its work, please visit www.monsheong.org.